How do you know if your diet is working? Like most people you’ve probably started a diet, but were not intentional enough on tracking progress toward your weight loss goal. And somewhere along the way you lose interest due to your lack of progress. With The Action Diet program you can start today on a successful journey. Allow a simple Excel spreadsheet to give you the feedback you need to remain on track towards your goal. There are literally dozens of diet and exercise plans that will help you lose weight. The Action Diet supplements your favorite nutrition and exercise program, keeping you honest and on target. By tracking your progress daily, and taking rigorous action when required, any diet you choose will get you there. EAT NORMAL Follow regular diet and exercise. You are reaching your Goal! MODERATE You are on target, but careful here! So what does “Take Action!” mean? For me it meant two changes to my ‘normal’ plan; 1) Nutrition Shakes (no solid foods), and 2) Increased Cardio. Increasing cardio could be additional time on the treadmill, an extra walk or jog, and/or taking the stairs at work instead of the elevator. As you move along toward your goal you will learn how much extra cardio is necessary to get back on track. Using The Action Diet program I lost 30 pounds this past year. My ‘normal’ eating plan was healthier, more portion-controlled meals than I had been eating. When I needed to take action, the nutrition shakes and additional cardio got me back on track. Nutritional shakes aren’t always much fun to prepare or consume. But it takes a little drastic action every now and then to reach your goals. My goal was always to get back to ‘eating normal’. Your body needs the feedback that ‘we are going to lose the weight!’. Send your body this signal and it will respond. Extra cardio, along with the shakes provided the environment necessary to get back on track towards my goal. 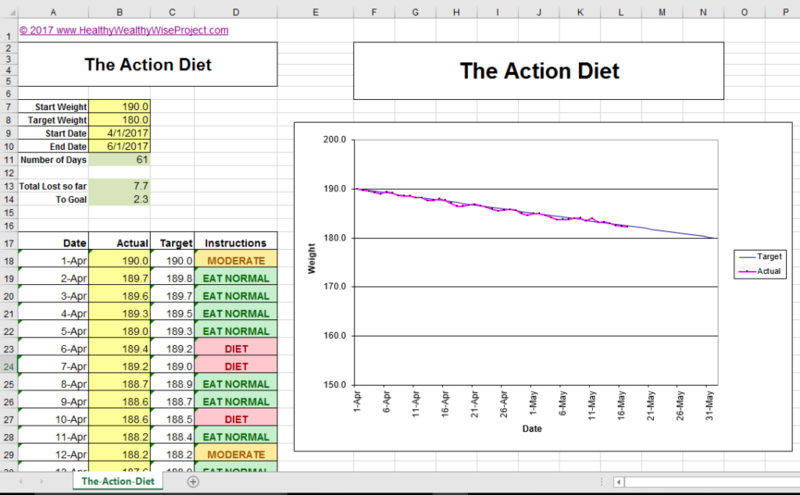 The spreadsheet draws your weight loss journey as a sloped line on your personalized chart. Weigh yourself every day and watch your progress as a new dot on the graph. If your dot is below the trend line, you’re on track! If your dot is above the line, you’re at risk of missing your goal. The spreadsheet tells you each day what action is necessary to reach your weight loss target. Contrary to conventional wisdom, we believe that weighing yourself every day is essential to losing weight and keeping it off. It enables a dieter to directly connect his or her eating behavior with the number on the scale. Eat too many slices of pizza and you will, we promise, see a couple of extra pounds on the scale the following morning. We also promise that as you adjust down the quantity of food you are eating, you’ll be hugely motivated to press on with your diet by the lower number you see on your scale. Knowing your daily weight and having it in your mind also acts as a priming mechanism against temptation. However motivated dieters are in the morning, often hunger pangs get the better of them later in the day. Knowing your weight sends a powerful reminder to stick to your guns and not reach for the candy bar or overeat at lunch. It has exactly the same effect that being reminded of your bank balance has just before deciding whether to splurge on a new TV you don’t really need. Every diet you go on takes commitment to be successful. But without measuring where you are on a daily basis you are not set up to succeed. Weighing in once a week leaves too much room for error or excuses. The Action Diet will become a simple part of your daily routine. Does this product enhance the weight loss goals you have? If you purchase this spreadsheet, will you use it soon? If the answer is YES to these questions, then I promise you will be satisfied with your purchase. The Action Diet is a simple and effective Excel spreadsheet program, available through my Research Offers page.